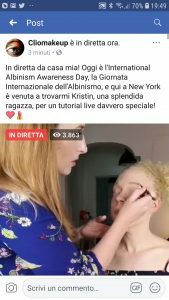 In occasione dell’ IAAD il 13 Giugno, Clio ha accolto con entusiasmo la nostra proposta ed ha realizzato un make up personalizzato ad una ragazza albina. 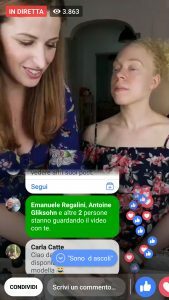 Grazie alla collaborazione della rete Internazionale di Persone con Albinismo siamo riusciti ad organizzare una diretta Facebook direttamente dal suo studio di New York! I boarded the bus for a 3 hour trip to NYC where I stayed with my grandmother in Manhattan. The “maps” app is my best friend when getting to places I haven’t been before, as I cannot see the street signs very well. I walked from grandma’s house to the Metro. I had made notes and prepared myself if they wanted to ask me any questions about albinism. I felt like a pro, I wasn’t really sure how this would be … would I be a specimen or would I be the model? Either way I was ready for my makeover. It was a hot humid rainy day. Of course, I forgot my umbrella and I just prayed that my curly hair would behave. I walked from the metro 10 minutes to Clio’s house in Brooklyn. I arrived to the gaited townhouse, took a deep breath and walked up to the door. I was greeted by the friendliest face and a hug and was invited in. It was Clio, there was a warmness about her that made me feel comfortable, as if I was just visiting an old friend. First, she showed me where the video would be done. It was a room in her home where she had more makeup than I would know what to do with. We had some time before the filming would take place, so Clio first played with foundation on my face to get a good match before going live. Clio ended up mixing 2 different shades of foundation for my skin tone. Though my skin is quite fair, I do have quite a bit of pink and yellow tones. Downstairs, I met Clio’s husband, Claudio, and her four cats Oscar, Mimi, Potter and Totti. We grabbed the umbrellas and the three of us decided to go out for some chicken. It did not feel like I was about to go on in front of thousands of people at all! I was excited to have some chicken. We went to a new spot right around the corner called Peri Peri Chicken. This was Clio and Claudio’s favorite place to eat and I can see why, it was so good. There we learned we all had a love for gardening and when we got back to the house Claudio gave me a tour of his garden and newly constructed patio. Then I met their baby daughter, Grace. She is so adorable it is no wonder all her fans adore her. It was time…. Then I started to get nervous. I looked in the mirror. I had no makeup. My hair had officially gone out of control. I could not hide, the hair had to go up. It was not my intention but at that point I did not care what anyone thought about my bare face, I was more concerned about my hair. When I came in the room Clio could tell that I had become a bit anxious and she was slightly disappointed I had tied back my hair. I was ok with it. Clio was also slightly nervous, she said she doesn’t often do live video, hers are usually filmed then edited before posting. Deep breath and it was time. I didn’t really know where to look, there were 2 big diva lights in front of me and I kept thinking there would be a mirror in the middle of that light but there was none. There was over 70k people watching me get my makeup done but all I could see was Clio and Claudio. Looking back at the video I can’t tell if my eyes are moving around because I didn’t know where to put them or if it was my nystagmus. Claudio was behind the camera. Clio was speaking Italian and Claudio would jump in and translate and insert questions being asked from the live feed. I was slightly fearful that the viewers might be not receive me well, however Claudio ensured that we got really positive responses from the audience. When doing my own makeup there are 3 things I have the most trouble with; drawing on eyebrows, matching foundation, and getting the mascara to completely cover my white lashes. In the tutorial Clio focuses on these areas to help anyone else that has trouble. You want the eyebrow color to not be reddish on fair skin. Go with a Taupe or light brown. When matching foundation, you should look at the neck and chest area. More companies have larger ranges of shades, but you can also mix different tones to get the right shade. However, do not depend on your foundation with SPF for sun protection. Sun screen should be applied before applying makeup. To cover the eyelashes completely, I struggle to cover the top, but you can take a small brush to go over the lashes as Clio did in the video. I was enjoying having my makeup done. But when it came time for questions about makeup my mind went blank! I currently don’t wear any makeup, rewind 10 years ago and you probably wouldn’t catch me walking out of my house without it. Partly, this was because I was trying to blend in and partly because I didn’t feel beautiful without it. I don’t feel like this at all anymore. If I do wear makeup, it’s not because I feel like I need it, I like how it can enhance the features that are already there. It is very liberating being comfortable in your own skin, it just took me a while. When the tutorial was finally over, I let my hair down and was given a mirror. I loved how natural the makeup looked. Nothing was too dark or over drawn. When it was time to go, little Grace approved and wanted to touch my face, she usually cries when she meets people she doesn’t know. I stepped out of the house and on my way back to the train I received many compliments!